When my grandpa would have a ripe jackfruit ready, it was quite a big production. Cutting into jackfruit is not like cutting into a watermelon. When cut, the fruit gives off a very sticky substance and it's really messy to deal with (which is why I enjoyed it so much when I was kid!) As it's cut open, little yellow knobs of fruit come bursting out and each knob has a large seed. The seeds are removed and each knob can be enjoyed as is. It's actually best to eat a knob slowly by picking smaller pieces of it off because it has a slight stringy consistency. As for the flavor, it reminds me a little of mango, apricot and pineapple, all rolled together. Jackfruit is sweet and is used to flavor lots of baked goods in the Philippines. The jackfruit pulp my parents gave me was a very thick consistency, similar to jam. 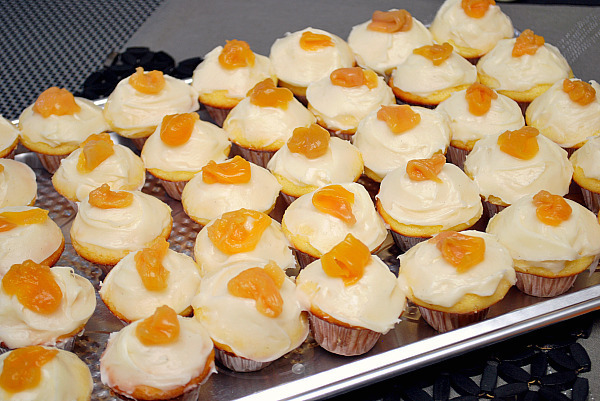 I used a little of this pulp with a yellow cake recipe to create my Jackfruit Cupcakes. 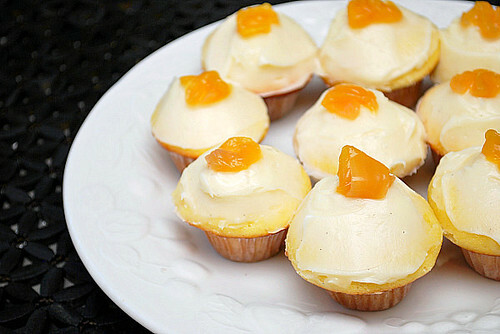 It has a very light, sweet and subtle flavor and adds a nice color to the cupcake. To decorate, I frosted the cupcakes with a classic cream cheese buttercream frosting and garnished with a sliver of jackfruit on the top. In a large bowl beat eggs til foamy, then add sugar to eggs and beat until light and fluffy. Add vanilla ,beat until blended. Alternately add sifted flour and cream. Beat until well blended. Stir in jackfruit puree until well blended. Pour batter into the prepared muffin pan. Bake for about 12-15 min. Cake should spring back when touched. Allow to cool completely before frosting with cream cheese frosting. Garnish with pieces of jackfruit. What a great flavor! Your cupcakes look wonderful. I love jackfruit! I have never had any fresh, only ever canned/jarred. I love to eat it plain or mixed into other fruits for a nice fruit salad. I will try this - it sounds like a great idea. Someone just gave me a huge jackfruit and I have loads of leftover. Was thinking of making it for breakfast and I found this recipe. Thanks!